1 Beautiful Rakhi 1 Set Of Tilak And Chawal With Pooja Thali. Free Shipping To Australia. 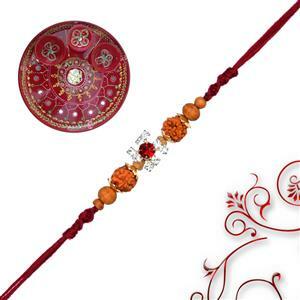 We Post All Rakhi For Australia Using Australia Post Or Local Courier. Rakshabandhan Or Rakhi As It Is Popularly Known Is A Festival Celebrating And Honoring Sibling Love. It Is Love At Its Purest & Deepest Level And Is Depicted In The Form Of The Sister Reminding The Brother Of The Undying Bond Between Them By Tying A Holy Thread And True To His Nature The Brother Reiterates His Pledge To Protect His Sister In Body Mind And Spirit. Note: Tracking Number Available Only For Express Post For Which There Is An Additional Charge Of $5. Delivery Only In Australia.